Apple's new tablet could soon prove both a vital launch pad and productivity tool for entrepreneurs. Call it the Apple iPad , "Jesus tablet" as some media insiders have, or just Steve Jobs's latest high-tech obsession. Either way, there's no getting around the seismic cultural impact of the consumer electronics industry's latest high-profile launch. However, as many tech experts have been quick to note, hype aside, there's little compelling reason for everyday shoppers or business owners to make the upgrade. Or rather, there isn't quite yet--a fact it may take months to remedy, and that leaves a gaping void just waiting to be filled by legions of budding entrepreneurs. At surface value, the iPad--a 9.7-inch LED touchscreen-equipped computer that offers multi-touch input, Wi-Fi/wireless broadband access and user-friendly multimedia storage, shopping and playback--promises power on par with a mid-range notebook PC. Debuting in late March in multiple configurations starting at $499 and up and ranging in size from 16GB to 64GB (3G high-speed cellular connectivity optional), Apple sees it spearheading a new category of mobile computing device. It sits somewhere between a smartphone and laptop in power and cost, and offering a 1Ghz Apple A4 chip that promises more advanced processing and graphics power than the iPhone. Consider, though: There's no telling yet whether this potential vertical exists. Still, measuring up at just 0.5 inches thin and 1.5lbs in weight, yet offering a full range of productivity functions, respectable horsepower and support for "nearly all" 140,000 current iPhone apps, it's a curious experiment. Resembling nothing so much as an overgrown iPod Touch, a comparison some critics have made with derision, the big question mark is whether it can address small-business owners' needs. Blame a range of intriguing, but not necessarily must-have built-in features, and current lack of killer apps--two major issues that could ultimately torpedo the tablet PC's sales and market adoption rates. Not that the iPad isn't doing its best to swing for the fences. Going straight for e-readers' throats with its iBooks virtual bookstore, bookshelf and reading application, it's hard to see how pricier, single-function models such as the QUE proReader will compete. Not only should the iPad make browsing, purchasing and skimming business books and publications easier, it may also make the process much richer and more informative, thanks to digital literature's integrated support for multimedia audio and video content. The device further promises to offer an array of functions from word processing and spreadsheet composition to options for screening music, movies and TV shows--all for a fraction of the price of traditional e-book players. In many ways, it's anticipated to do for aspiring business and non-fiction authors what the App Store did for legions of bedroom coders. Providing a ready means to connect with an audience, build a following and establish yourself or your brand as a subject-matter expert, potential marketing and advertising applications are boundless. Moreover, the iPad could grow the e-book audience to the point where small presses actually have the opportunity to readily experiment with new formats, packaging strategies and prices. Or, for that matter, shift copies of their latest works, compelling case studies and innovative methodologies in respectable numbers, or at least profitable ones, given the relative cost savings of digital versus physical content delivery. Steve Jobs and company have also taken great care to demonstrate marked support for the professional user, as illustrated at the gadget's recent unveiling. Out of the box, the iPad doesn't just spare you the headache of having to purchase software programs you own on the iPhone again, many of which can also be "pixel doubled" to fit the device's display and take advantage of its enhanced visibility, brightness and larger screen real estate. It also has the capacity to run more advanced productivity apps (downloadable, bite-sized software applications) that offer better, more ergonomic touch controls, a greater range of complex features and expanded online connectivity options. Whereas current office suites for the iPhone provide limited functionality and a smaller feature set as compared with desktop alternatives, make no bones about it: The iPad is a true portable computer, not simply an enhanced smartphone (although the iPhone and iPad do share an underlying operating system), and software utilities for the iPad will better approximate full-fledged desktop cousins. Among its main benefits to business users is enhanced Web surfing, with sites readily visible in either portrait or landscape mode, and user input facilitated via intuitive gestures and an on-screen virtual keyboard. The experience benefits from greater room to scroll by swiping a finger, zoom in just by pinching, and, at odds with smartphones' cramped screens, more closely resembles what you'd resemble from the traditional internet browsing process. Alas, support for the Flash software platform still isn't included, limiting access to certain videos, sites and online games. Nor can users multitask (switch between simultaneously running programs), which seriously calls into question its ability to serve working professionals. Downloading and viewing standard or high-def online video through YouTube or iTunes is a much more enjoyable experience though, and may open a wider audience for digital footage, making it a ready platform for entrepreneurs to serve taped testimonials, webinars and commercial spots on. Extensive e-mail support is also offered (as is sideways or vertical message viewing) through a cleaner user interface than that found on the iPhone, whose split-screen views, drop-down menus and pop-ups make scanning your inbox and responding to queries a snap. Extensive support for multiple calendars and notes is also featured, and it's easy to quickly add and browse contacts, pull up important phone numbers or access full-color maps as needed as well. Far-reaching search options allow you to quickly skim the entire device for names, details and addresses. Given the not inconsiderable price, which swells further when you consider the pressing need for a monthly data plan, more storage space and accessories such as a physical QWERTY keyboard and carrying case, let's be frank: The iPad is destined to directly compete with standard laptops. The most pressing issue is whether you'll consider it a worthy replacement for your current portable PC workhorse, especially if features like a dedicated 3-D video card, Web camera, high-end CPU, multitasking performance and Windows compatibility are potential sticking points. On a positive note, Apple's put on a convincing show of demonstrating how its Microsoft Office-like iWork application suite--which consists of Keynote (slides/presentations), Numbers (spreadsheets) and Pages (word processing) programs--empowers small-business owners. At just $9.99 each for the motion-sensing applications, which support standard desktop documents and PDFs, it's a relatively simple matter to create and edit charts, graphs, functions, formulas, slides and documents. Multi-touch input further makes all intuitive to browse by tapping or dragging a finger. But as much as we appreciate the ability to access slideshow templates with a poke, shuffle pictures and text layouts just by swiping or scroll through marketing plans with a flick of the wrist, let's be honest: Gesture-tracking commands are nice, as is compatibility with Mac-built and Microsoft Office documents. Still, we find it hard to believe road warriors would be well served without owning a dedicated, real-world keyboard; options for easily swapping between multiple programs; or having the option to easily expand internal memory or processing hardware. Because it's primarily a digital lifestyle device, we don't see legions of entrepreneurs making the switch in 2010. But once enterprising entrepreneurs begin to crank out productivity apps and other programs (social media clients, cloud computing tools, voice-over IP services, etc.) en masse, the device could quickly come into its own as an entrepreneur's best friend in the next 18 to 24 months. 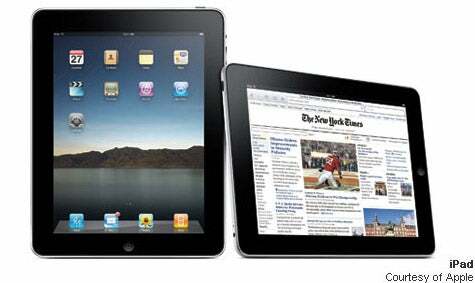 The iPad isn't the be-all, end-all portable computing device that tech experts envisioned. But as it's done with the MacBook, iPod and iPhone, Apple will surely continue to innovate on the hardware, while competitors such as HP, Lenovo and Microsoft toy with the possibility of introducing competitors of their own. All of this could add up to a potential renaissance for the entire tablet PC category. In terms of features, convenience, value, price and performance, that's a potentially huge win for entrepreneurs and everyday consumers seeking a more portable, flexible and lifestyle- and value-minded solution for accessing treasured digital content.